There are several types of puzzles that stimulate the human mind apart from being fun to solve. The most famous and commercially successful sliding block puzzle was invented in the 1870's. It was known as the “15 puzzle" or BOSS puzzle. 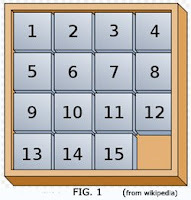 The puzzle consists of a block of 15 numbered small square blocks within a larger square box (4 x 4) capable of holding 16 such blocks, with one empty space. These are set at random (by sliding) to get an arrangement and the player has to slide them (without lifting) to get them in order with the last space vacant as shown in FIG 1. One of America's greatest puzzle expert, Sam Loyd,"drove the entire world crazy" (as he himself put it) with this newly invented puzzle. (Now it has been discovered that he did NOT invent this puzzle but falsely took credit for it.) He had made it famous by offering a prize of $1000 for a correct solution of the puzzle. As Martin Gardner puts it "'Thousands of people swore they had solved it but no one could recall the moves and collect the prize.Loyd's offer was safe because this particular one was not solvable.". Of more than 20 trillion possible arrangements of the squares, exactly half can be made by sliding the squares if the initial position is as shown in FIG 1 and thereafter jumbled up randomly. But if the 14 and 15 are interchanged and then jumbled up, we have a disturbed the ‘parity’ (to use the language of permutational mathematics)". And is not solvable. I now show you a video of how to solve it using an algorithm used by 'THEmuteKi' in Youtube.